Recordings of Rebecca Clarke’s Viola Sonata are arriving relatively thick and fast these days and I’ve reviewed my fair share (for example, the Aevea release this year - review). Here’s one with a difference. It’s heard in the composer’s own contemporaneous cello version and played by Raphael Wallfisch and John York in their all-Clarke disc. Clarke carried out the cello version with the help of her colleague and friend, cellist May Mukle, something of a trailblazing figure among British cellists of her day, though she left behind pitifully little in the way of recordings. Wallfisch and York play this nicely up to tempo and it sounds idiomatic in this version, forming an interesting addition to the cello sonata literature in much the same way as works appropriated by Lionel Tertis for the viola. This contemporary of Clarke did strangely little to promote her work; perhaps he didn’t like its occasionally astringent sections. The virtuosic passages in the Scherzo are manoeuvred with guile and agility and the duo brings eloquence to the slow movement. Their performance is certainly not intended to usurp the work for cellists but does offer an interesting slant on the Sonata. The 1923 single-movement Rhapsody has never enjoyed the esteem accorded to the Sonata even though it’s a work of complex structure and rich characterisation. The opening tolling piano motif sounds more overt in the competing version on Dutton (CDLX7105) played by cellist Justin Pearson and pianist Ian Jones whereas the tolling piano and elegiac cello come from a slight recessive distance in this Lyrita performance: the effect is the more impressive. Equally, the greater weight and shading of tonal colours gives this Lyrita performance added standing, as does the way the two players convey the music’s feeling of instability and urgency and its lyric austerity too. In a work as complexly structured as this, with dissonance and post-Debussian harmonies, as well as the occasional spectral Scriabinesque piano writing, one needs a duo unafraid to draw the listener in. That is assuredly the case here, not least in the touches of folklore in the scherzo-like section and in the anguished Lento, incrementally relaxing finally to admit the cyclic toll of the piano. Lyrita has advantageously tracked each of the work’s sections – it demarcates naturally into a four-movement structure – whereas Dutton has just the single track. I’ll Bid My Heart Be Still is a musical love letter from Clarke to her Scottish husband, James Friskin. Like the Sonata, it’s rare to hear it for the cello. The Passacaglia on an Old English Tune was written a few years earlier and has a passionate intensity about it at a fast tempo. Some Clarkians will find it too tempestuously vigorous, I suspect. The Epilogue is an early work, dating from around 1921 and is finely judged here in respect of tempo and bow weight. 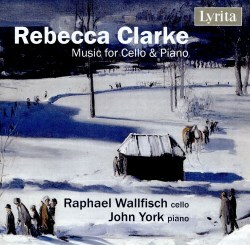 Finally, there is another surprise in the shape of John York’s own Dialogue with Rebecca Clarke, written in 2007, an ingenious and exciting work that draws on themes from the Viola/Cello Sonata. It was written for the Moldovan violist Mikhail Mouller. York, incidentally, is creating a performing edition of the Rhapsody in collaboration with the Rebecca Clarke Estate. Despite the increasing number of recordings devoted to Clarke’s music, this one stakes a very personal case in its all-cello-and-piano focus and will be welcomed – and admired – for its excellence.